Many Early Years settings are taking in children for longer periods and at a younger age. However, their day-to-day practice has not necessarily changed and instead leads to the 'management' of behaviour, rather than investigating why the behaviour is taking place. Through a combination of practice, theory and reflection, leading Early Years education consultant Penny Tassoni explores children's behaviour from a child-centred point of view. In doing so, she shows how, over time, children learn to be with others and the strategies that adults can use to positively support this development. 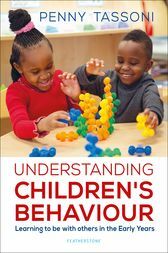 Understanding Children's Behaviour is a practical handbook that is accessible and adaptable for Early Years practitioners looking to support children's behaviour by focusing on their personal and social skills. It includes a useful A-Z problem-solving section about dealing with unwanted behaviours for analysis and to guide practice. Penny Tassoni MBE is an education consultant, author and trainer who specialises in the whole spectrum of learning and play. Penny began her career as an Early Years teacher before training nursery nurses. She has also worked for a large daycare chain as their education and training manager. Penny has written forty books, many of which are core textbooks in the UK for training nursery nurses and Early Years teachers. In February 2013, she was asked to take on the role of President of the Professional Association of Early Years and Childcare – an organisation with over 35,000 members in the UK. Penny is a well-known speaker and trainer. She regularly visits and supports nurseries and pre-schools which allows her to maintain regular contact with babies and young children. She also works regularly in Turkey and has supported nurseries in China, Dubai and Hong Kong.